"I Am Going to Be the Best"
Christopher Adlesperger was a "soft hearted kid" his grandmother said. Christopher Adlesperger, of Albuquerque, New Mexico, received the Navy Cross when he singled handedly eliminated 13 Taliban in a vicious firefight. While he will always be remembered for the outstanding actions, which earned him a Navy Cross, his grandmother, Lynda Adlesperger, described the young man behind the heroics. He is most commonly described, by those who knew him, as a soft-spoken, religious young man who loved poetry and art. What people don’t know are the difficulties he had to endure early in life. When only 3 years old his parents divorced, leaving Christopher with the struggles of growing up in a single parent household. Like many children of divorce, Christopher was forced to grow up quickly. He also showed a great sensitivity towards the weakness and vulnerability of those around him and never refused them a helping hand. When bullies at school singled out the weaker kid to pester, Christopher was the one stepped in to defend the innocent. His interventions were never done in anger however since he was generally not one to lose his temper. In fact he was a very easygoing kid who was known to play practical jokes and tease people. Mrs. Adlesperger witnessed a sample of his lighthearted banter one day when their elderly neighbor lady, out of gratitude for Christopher’s help, baked him some cookies. This was her way of repaying the young man for voluntarily mowing her lawn. With a twinkle in his eye, Christopher looked at his grandfather Edwin and said, “You don’t get any.” Only after a long and playful exchange between the two, did Christopher allow his “grandpa” a sample. 2001 photo of Christopher left with his grandfather, the same year that Edwin Adlesperger was diagnosed with Alzheimer's disease. After his parents divorce, he practically grew up in his grandparent’s home and became extremely attached to his Grandfather. It was clear that of all Mr. Adlesperger’s grandchildren, Christopher was without a doubt, his favorite. Seeing the struggles he faced, Mr. Adlesperger paid a lot of attention to him, helped him when he was in trouble and was always there to listen. In 1998 Mr. Adlesperger health began to decline rapidly due to emphysema and an enlarged heart. In 2001, when Christopher was only 14, Edwin was diagnosed with Alzheimer’s disease. Christopher was devastated. He had grown so accustomed to rely on his grandfather’s guidance during difficult times. True to his nature, he remained strong for his grandmother. Mr. Adlesperger would now need round the clock care, and she needed his help. “You could not have asked for a better kid,” she said. In 2004 Edwin Adlesperger died and Christopher felt completely lost and without direction. “He didn’t fit in anywhere, except with his grandfather,” Mrs. Aldersperger said. “At 19 years of age,” she continued, “he decided to join the Marines. “Of all the [branches] why Marines?, she asked. Within a week of this decision, he was gone. After boot camp, he came to see his grandmother one last time, in September of 2004, before deploying to Iraq. She described him as being nervous, but he faced his fear like a man. When asked why he chose to join the Marines, Christopher, shown here in his dress blues, responded, "I am going to be the best." On November 4, 2004, Mrs. Adlesperger received a letter from him. Always thinking about others, he simply wanted to let his grandmother know he was okay. On November 10, 2004, Pfc. Christopher Adlesperger entered the hall of heroes and is considered to be responsible for destroying the last strong point in the battle for Fallujah. It occurred when Pfc. Adlesperger’s squad was clearing houses in the Jolan district of Al Fallujah. As they burst through the gate of one house, they were hit with heavy fire from a well-prepared entrenched machine gun position from within the house. His best friend, Lance Cpl. Erick Hodges, was immediately shot and killed while others were wounded. A violent shootout ensued with both sides squaring off a mere 20 feet from each other. As the Marines fought back, terrorist inside the building began lobbing grenades. A sniper in a nearby alleyway picked off corpsmen, radio operators and anyone else attempting to lend a helping hand. As the world crumbled around him, Christopher Adlesperger exposed himself to machine gun fire in order to help those wounded reach the safety of an outdoor stairway leading to the roof. During the process bullets tugged at his clothing while shrapnel from a fragmentation grenade ripped through his face causing intense bleeding. All of this made an impossible situation worse. Looking death in the Pfc. Adlesperger continued to exchange fire with the machine gunner, when he saw several terrorist storm the staircase. He quickly eliminated them, before arriving to the roof where the wounded were able to receive medical treatment. As he looked down at the carnage below he was horrified to see several terrorists unnecessarily riddle the lifeless body of Eric Hodges before putting one last shot in his head. As another terrorist ran from the house to retrieve Hodges weapon, Pfc. Adlesperger stopped him dead in his tracks with a single shot. Meanwhile the machine gunner inside the building continued to hold Marines at bay. Adlesperger laid his M-16 down long enough to blow holes in the side of the house with his grenade launcher. Four insurgents fled the barrage only to find themselves in Christopher’s crosshairs and were quickly eliminated as well. Disregarding his own wounds and physical exhaustion, Private First Class Adlesperger rejoined his platoon and demanded to take point for a final assault on the same machine gun position. Once an Assault Amphibian Vehicle created a breach in the wall adjacent to the enemy’s position, Private First Class Adlesperger was the first Marine to re-enter the courtyard where he eliminated a remaining insurgent at close range. When the fighting finally ceased, a significant number of insurgents from fortified positions had been eradicated. Through his actions, Private First Class Adlesperger destroyed the last strongpoint in the Jolan District of Al Fallujah and saved the lives of his fellow Marines. Although Christopher Adlesperger survived that terrible battle, he would not endure a similarly intense encounter with the enemy a month later. As our Nation was deciding on whether this brave young man would receive the Medal of Honor or Navy Cross, Christopher gave the ultimate sacrifice and was gunned down during another intense firefight. Once again he had taken the lead position when his battalion was assigned to sweep another neighborhood in Fallujah. As they entered a non descript house, Pfc. Adlesperger was hit with multiple rounds which spun him around: one bullet slipped by the protective plates in his body army, pierced his heart and killed him instantly. Christopher Adlesperger at work in his grandfather's backyard. He was always willing to help those in need and defend the underdog. When we contemplate the life of this extraordinary young man, we are amazed at the remarkable transformation Christopher Adlesperger underwent in just three-month-period. 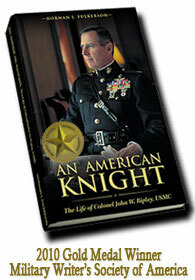 From care giver to his grandfather, he became a United States Marine and rapidly went on to become a national hero. Yet through it all he retained the same upbeat spirit, determination and the willingness to help those in most need. While a bullet might have stopped Christopher Adlesperger’s very big heart, it did nothing to diminish America’s affection for someone who is truly a Modern American Hero.